1. CLEAN OUT THE CLUTTER! Get rid of everything and anything that isn't being used constantly. I only wear a handful of outfits and those are what is in my wardrobe. The items that I haven't worn in 6 months I PURGE, and the ones that I really believe I will want to wear someday but don't get worn weekly go in a big closet in another room. 2. 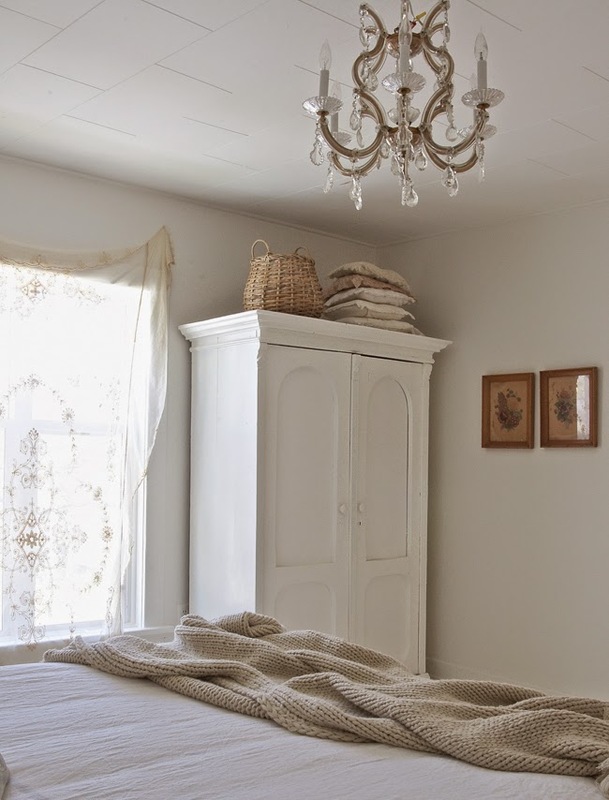 CHOOSE YOUR FOCAL POINTS - In my case, it's the dark headboard that stands out and has a beautiful, romantic design. The chandelier is also another focal point. Everything else should almost blend together. 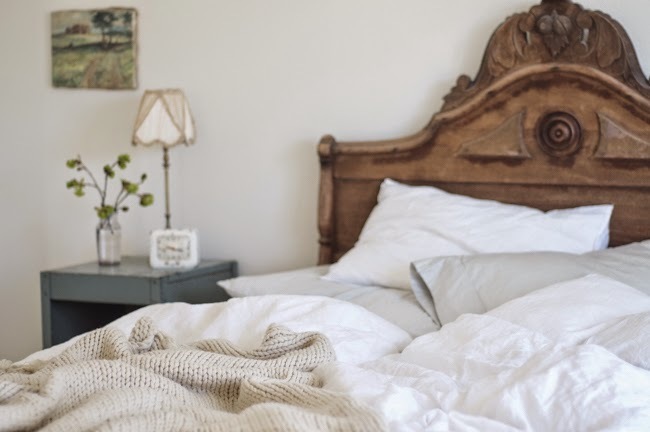 I chose not to use the footboard of this bed because it would have been too much and would have taken away from the glory of the headboard. I recently painted the floor white and I LOVE it! It helped me get the airy feel I love so much. I also painted the walls and trim the same white so as to not get too many lines to draw the eye (Benjamin Moore's Regal Select paint in "Glacier White," color #OC-37). I chose a high, off-the-ground table for one side of the bed for that airy feel again, and the aqua table for the other side to add just a pop of my favorite color. I chose very dainty, but matching lamps to keep things minimal and again not pull the eye to too many places. 3. MIX CURVY LINES WITH STRAIGHT - Curvy lines are romantic, but get too many in one room and it gets too busy. My headboard has the romantic lines so I chose side tables with straight lines to give it balance and not create busyness. Our H&M pieces were provided for us by H&M, but all thoughts and opinions toward the products are our own. We wouldn't promote something we didn't love 100%! I added a vintage lace tablecloth to cover my boxspring and add some romance. 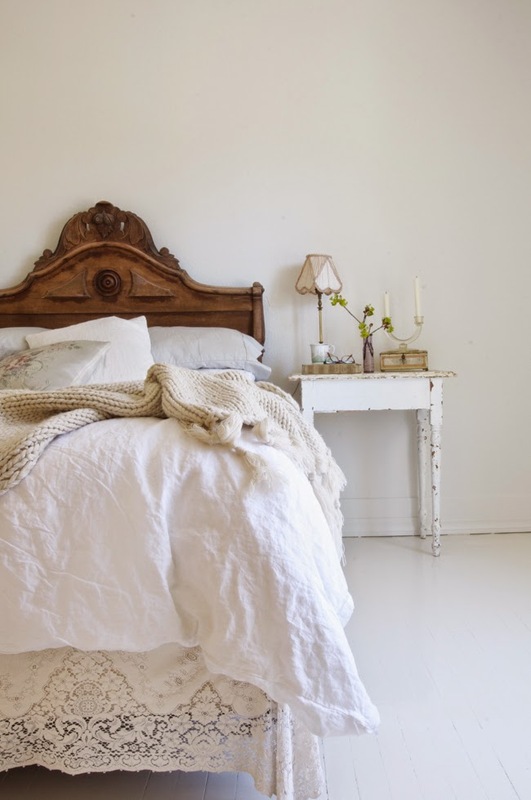 Altogether the bed doesn't have too many colors or patterns to distract the eye but plenty of texture and warmth. 5. NO CURTAINS - Now, I don't think that you HAVE to do away with curtains to get a minimal look. But it certainly helps. 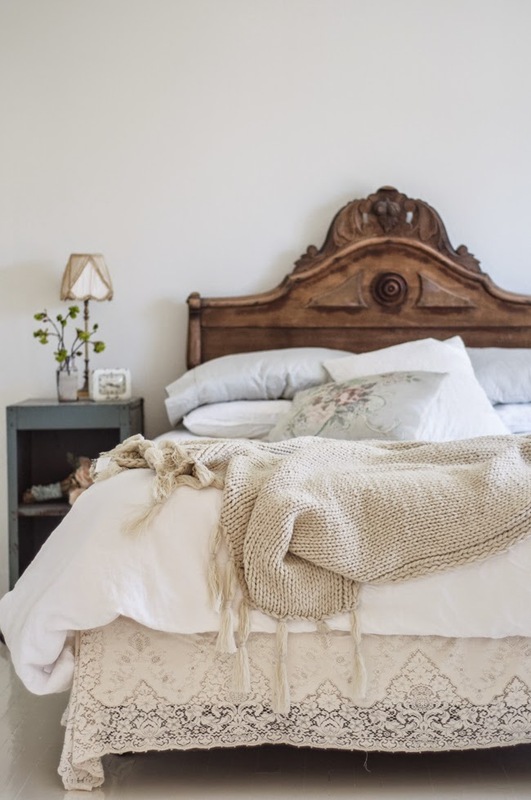 But if you like a bit of privacy in your bedroom as I do, a lightweight curtain, or in this case, an antique lace bed coverlet will help give you a dreamy, minimal look. 6. USE A LITTLE FLORAL - In my case I have one floral pillow, a couple small paintings or prints and of course some fresh flowers next to the bed. Nothing says romance like fresh flowers! 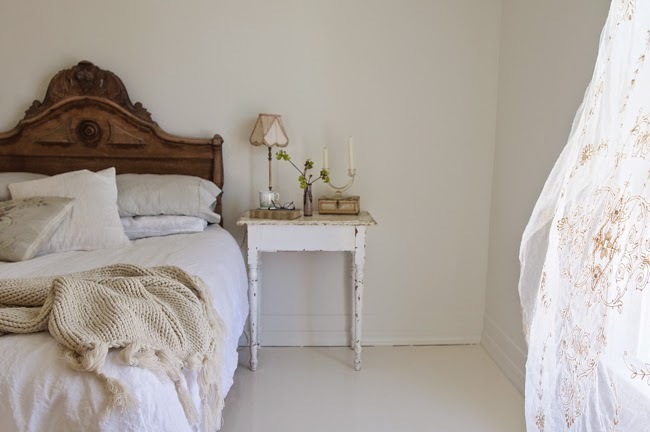 Stay tuned....more amazing bedroom inspiration to come shortly! Gorgeous bedroom! 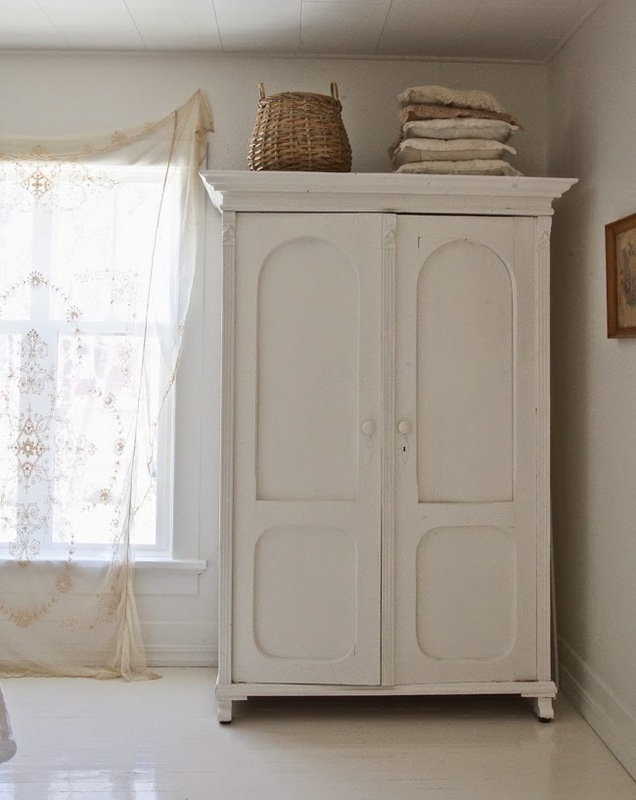 I love your style - simple, vintage, clean and sweet. Your home is one of my most favorites. I'm really loving the stripped wood look, stripped pine has always been my preference but so hard to find. Hi there! I used Valspar oil-based Porch and Floor paint in Quail Egg. Good luck with your room! I'm sure it's going to turn out so beautiful! Hi! My husband and I just bought our first house and I've been searching around for some ideas for decorating our guest bedroom. When I saw this on pinterest I fell in love! Immediately I thought it was perfect. I know you listed the sources for the duvet and throw from H&M, but I was curious where you got the sheets/pillowcases and the floral pillow. I have been looking around but can't find anything that seems to match that color. I also wanted to ask where you got the tablecloth for the bed skirt! I think that is such an awesome idea! This room is gorgeous! Out of a dream bedroom! It's just beautiful! I love every detail! Wow, I love this post, it is truly inspirational... because I like vintage romance, but hate clutter and business. I love the simple. It is so hard to find this simplicity with vintage. Its gorgeous... just gorgeous. This is exactly my esthetic too! 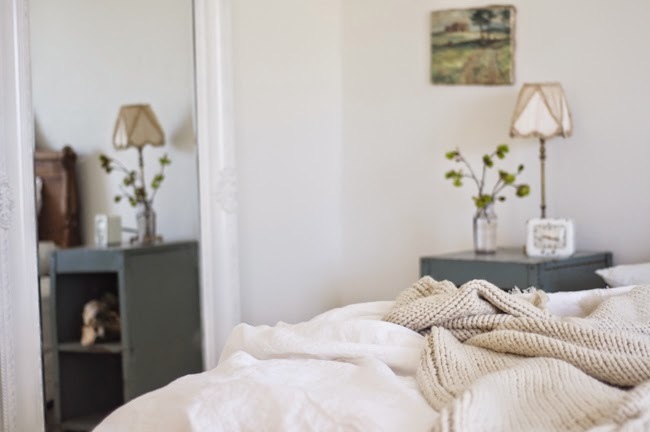 Clean simple elegant no distractions from the clear drama of the room...in this case your gorgeous headboard. Love that cute pretty floral accent pillow..a little whimsy sweetness thrown in. Where did you find that bit of gorgeousness? I'm sure a vintage something that I will never be able to get my hands on but like the rest of the room keeps my heart jumping for all of it's beautiful inspiration. Hi Vanessa...my client pinned an image from your bedroom dated May 7 2015. She loved the craved wooden headboard. I was wondering if you might consider sharing where you got it? Many thanks for any information. Such a gorgeous space and all great ideas! Love it! I love this look!! Where did u find your lace tablecloth? Hi! 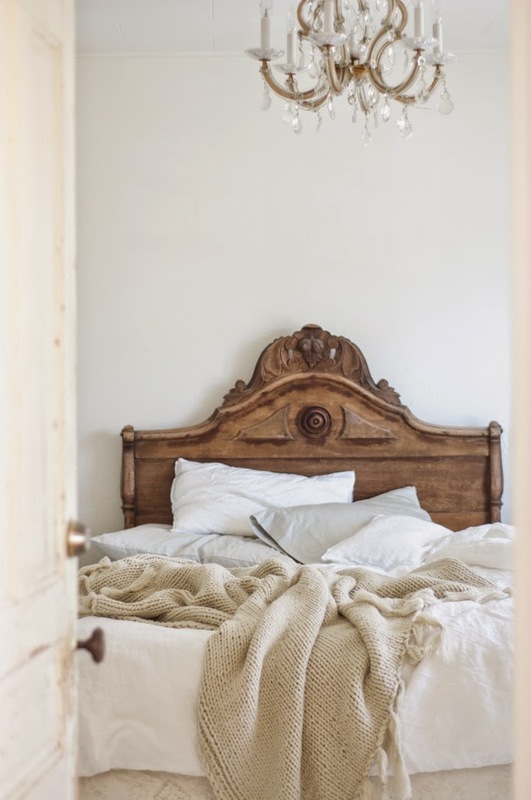 I would love to know where this beautiful headboard is from?